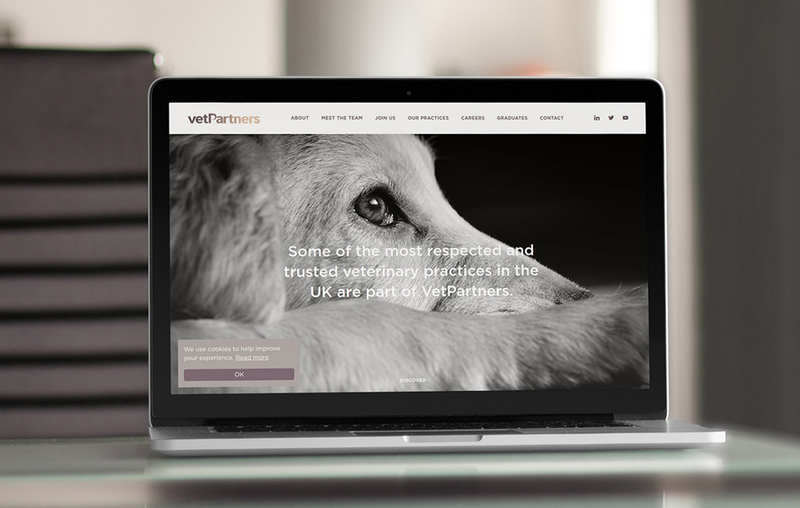 We’ve recently launched a new ‘phase two’ website for VetPartners. The company has grown and changed exponentially since it’s inception in 2015. Having worked with VetPartners on a number of projects over the years, we were looking forward to getting our teeth stuck into this one. The old site, though appropriate for the brief at the time, was a fairly simplistic design. This no longer suited them as a company. (You may remember we introduced you to VetPartners here). We began working with the newly introduced marketing department to interrogate the brief. We then began to wireframe up the key pages of the new site. We’ve used the original branding but with much more content and direction to help make it really come to life. VetPartners aim their services at practices owners who may be thinking about retirement, looking to boost their practice financially or simply want to hand over the business side of things to someone else so they can focus on just being a vet. VetPartners want to help safeguard the future of the individual practices and their staff without losing any of the individuality that the clients and patients are familiar with. By doing this Jo and the team are hoping to help protect the practices, and in fact the whole veterinary profession, that they’ve spent their lives working for. The key objectives of the VetPartners site revolve around recruitment and the main CTAs you’ll see throughout the site reflect this. This is mainly either to aim to tempt new practices to join the group, or to encourage vets and nurses to want to work for VetPartners. They were also keen for users to be able to easily locate the VetPartners practices on a map, using a town or postcode search to group areas and a filterable list of all practices and their branches, now that there are so many! If your website could do with a refresh or isn’t quite representing your company accurately then please get in touch. We’d love to find out how we can help.